Why serially incumbent Kurdish Governments should ring alarm Bells for John Kerry? Democrat John Kerry inherited the job of Secretary of State from Hilary Clinton. As President of the United States her husband Bill Clinton helped Turkey kidnap Kurdish leader Abdullah Ocalan in 1999. Unfortunately Ms. Clinton continued with her husband's anti-Kurd policies in favor of Turkey. John Kerry knows very well that the US used many South Vietnamese leaders against Ho Chi Minh and because of that the US lost the Vietnam War. The Clintons did not have any first-hand experience of the Vietnam War but John Kerry as the US Secretary of State has. Repeating the failure of Vietnam, the US, Israel and the EU decided to replace Kurdish leader Abdullah Ocalan with Massoud Barzani in Kurdistan (the land under occupation by Turkey, Iran, Iraq, Syria, Armenia and Azerbaijan). 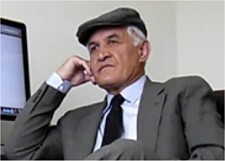 While his father, Mullah Mustafa Barzani, was reputed to be illiterate, but Massoud Barzani claimed authorship of one book most likely with the help from several people. However, Abdullah Ocalan has written forty books. Is it any wonder that the entire Kurdish people are following him, while only a small number of Kurds are following leaders such as the Barzani and Talabani families in the interests of improving their fortunes? It is easy for observers to blame Kurdish leader Abdullah Ocalan for his negotiations with Turkey. First they are not responsible for the Kurdish freedom fighters' welfare and the Kurdish people. Second they are dealing with the corrupt Massoud Barzani who is renowned for ordering the murder of Kurdish investigative journalists and abusing the Kurdish people from which an average of four women are "honor' killed each day. P rominent Turkish sociologist and Kurdish people's hero Ismail Besikci's statements against the Kurdish leadership in Turkey, especially against Kurdish leader Abdullah Ocalan and an article by Kani Xulam from the American Kurdish Information Network in the USA along the same lines indicate both men have one thing in common - they are promoted by Barzani and the Turkish media.